The location of the legendary empire of Atlantis is perhaps one of the most contentiously debated issues in all alterna­tive archaeological circles. The small Bimini Islands, located a scant 50 miles from Florida, are at the center of an even more controversial debate—especially from those who favor the location of Atlantis virtually everywhere and anywhere in the world except in the Bahamas. Yet dozens of explorations at Bimini and associated areas have been ongoing since the mid-1930’s. While mainstream archaeology has essentially turned a deaf ear to all that has been re­ported by recent researchers, these ongoing efforts have now yielded an overwhelming amount of evidence showing that an unrecognized maritime culture was active in the Bahamas as early as 3000 BC. However, one key type of evi­dence has been missing, and it is the same type of evidence missing in virtually all other Atlantis search expeditions and claims. That is clear archaeological evidence dating to the time of Plato’s Atlantis—circa 10,000 BC. That evi­dence may now have been found at Bimini. In September 1968, zoologist Dr. J. Manson Valentine announced the discovery of the underwater “Bimini Road” (or “Bimini Wall”) igniting a sensational and often irrational series of exchanges between proponents and skeptics fo­cusing on the precise nature of the stone formation. However, many other seemingly out-of-place artifacts were found underwater around Bimini. These included cement columns and fluted white marble columns close to shore, a large deeper area strewn with many larger columns, stone circles, and marble remains north of Bimini. In 2004, with archaeologist Bill Donato, we began a series of careful explorations of all of these finds. We discovered that the Bimini Road defied virtually every claim made about it by the skeptics except for its type of rock. The 1600-foot-long, J-shaped, formation has many multiple tiers, many support and prop stones stacked under large blocks to level their surface, trenches under many of the large blocks to facilitate water flow, tool marks, and several examples of artifacts under large stones. Then we found a series of stone circles near the Bimini Road that are identical to what are called “mooring circles” at several ancient Mediterranean harbors. Literally dozens of stone anchors, identical to Phoenician anchors, have been found associated with this area. Next we discovered another underwater stone formation that is about a mile from the Bimini Road. This formation, called the Paradise Point Pier, is clearly a previously unknown manmade pier or breakwater extending from the shoreline. It rises off the bottom and has several layers of stone blocks. What has emerged is the conclusion that Bimini was utilized as a port where several harbors were formed from stone breakwaters and flat stone piers. The earliest of these was the Bimini Road, which would have been uti­lized as a harbor around 3000 BC, and the others would have been active more recently as sea levels continued to rise. We also found that several other similar formations, at the same depths, existed at Andros and Cay Sal, which strongly points to a large maritime trading network. It is commonly thought that in 10,000 BC the sea levels were 300 feet lower than today; however, that is not the case. Research conducted by underwater archaeologist Michael Faught (conducted while he was at Florida State Uni­versity) has shown that by 10,000 BC, the sea levels in the Bahamas and Florida were around 110 feet lower than to­day. The 300-foot-lower level was actually reached around 17,000 BC and before. While our ongoing efforts at Bimini showed definitive and stunning results, they did not date to 10,000 BC for the simple reason that in 10,000 BC all of the harbor formations we have found were then well above the shoreline. In the 1990s a series of expeditions took place at Bimini led by Dr. Doug Richards, Dr. Joan Hanley, and archaeol­ogist Bill Donato with a host of other people. These investigations looked at deeper water sites around Bimini using specialized divers, submarines, and side-scan sonar. In the past few years the Cayce organization (Association for Re­search and Enlightenment—A.R.E.) has sponsored a series of extensive side-scan sonar and sub-bottom profiling pro­jects that have now scanned nearly the entire area of the western side of Bimini. In November 2006, one large project, led by Donato, identified an intriguing area in 90 feet of water located about four miles or so off the Bimini coast. In a swath of the bottom, perhaps a half-mile or so long and 300 yards wide, a series of rectangular and square formations were identified by the side-scan sonar. The formations were fairly uniform, had straight sides, and were oriented in the same way. Curiously, all of them lie on what is a ridge next to a drop-off falling to 110 feet and then lower. In essence, the formations sit just above the edge of the 10,000 BC shoreline. Donato attempted to dive the formations; however, the area is on the edge of the Gulf Stream, and the currents at this site made diving impossible. Donato then sent us his side-scan images and the location of the formations. In 2007 we went to Bimini with our own side-scan sonar and quickly saw the same curious square and rectangular for­mations on the surface monitor. On that trip Master Divers Eslie and Krista Brown made a brief dive to one of the rectangles in which we had managed to anchor. During the dive the Brown’s took only a couple of photos because the dangerous currents made it difficult for them to maneuver over the formations and created reduced visibility. Upon our return, we developed the photos, and they were so murky that virtually nothing was discernible. However, con­verting one photo into black and white showed something intriguing. We could see what looked like a wall formed from stone blocks. In 2008 and 2009 we participated in several documentaries for The History Channel, Vision TV, the International History Channel, and National Geographic. Several of these shows were on the Bermuda Triangle mystery, because we had found 14 planes in the Bahamas with some on the official list of planes that “disappeared.” For a new series on the History Channel, called Mystery Quest, we participated in two shows, one on the Bermuda Triangle and another on Atlantis, both initially filmed in January 2009. They contracted a highly experienced professional diver, David Ul­loa, to film underwater using HD film. We examined several intriguing underwater plane wrecks at Bimini and at An­dros and also filmed at the Bimini Road. However, one of the key things that was to be on the show was the first real expedition to the 10,000 BC shoreline—the rectangular and square formations. On the day we allotted for the dive to the rectangles, the weather conditions were simply impossible. Neither our boat nor the safety boat could manage to secure an anchor. Both winds and waves were high and all prospective div­ers, boat captains, and Dive Masters agreed that it was extremely unsafe and called off the attempt. Several months later, before meeting up with a National Geographic film crew at Bimini to film yet another show on the Bermuda Triangle, we tried to utilize a high-quality drop camera at the rectangle site. Again, the weather thwarted our efforts. However, while with this film crew, we were contacted by the History Channel crew who wanted us to meet them at Bimini in two weeks. The network had seen the film and wanted to really explore the most impor­tant area—the rectangles— as a focal point of the show. So two weeks later we took our boat back to Bimini, two days before the film crew would arrive. Over those two days and in good weather, we managed to obtain about two hours of film of the site utilizing our drop camera. When the History Channel arrived, David Ulloa accompanied them again bringing along a rebreather, oxygen, and a 100-pound dive torpedo used to propel him and his camera housing underwater. Eslie Brown made a preliminary dive taking down our drop camera, with that film feeding into the History Channel recorder. Lora and I then dove the site reaching a maximum depth of 110 feet. At that depth we were able to stay under water a total of 20 minutes. David however, dove several times staying underwater for about 3 hours. We viewed David’s film at Bimini while being filmed for a segment in the show. His film is stunning and will be shown on the show. The images accompanying this article are from our drop camera. The main area that we identified on this trip is about a half-mile long and a couple hundred yards wide and lies at a depth of 90 feet. It is a flat, sandy bottom with little growth and almost no debris. All of us remarked that it looked like a flat, white sand desert. At the western edge of this flat area there is a distinct drop-off that descends to 110 feet. Then it gradually falls off to much deeper depths. On the 90-foot-deep flat area, there are about 35 clearly defined for­mations or structures lying on the bottom. All but one or two of these are square or rectangular. The few exceptions are round. These formations are all well defined, have what appears to be regular spacing between them, and all have a similar orientation of their sides. From the side-scan sonar images and visual inspection, the largest are about 25 by 15 feet with many being about 12 by 20 feet or so. Almost all of the formations have distinctive outer walls; however, in almost every area these are completely covered in thick and dense coral growth. The outer walls range in height from 3 to 6 feet. Curiously, as one moves over the formations, many have depressed center areas. These give the dis­tinct appearance of once being a walled structure—missing a roof—where coral grows best on the outer walls while the sand that settles inside the formation is less suitable for coral growth. During our brief 20-minute dive, we were able to inspect only two of these structures. From a short distance what looked like seams between building blocks were visible, but on close inspection all that can be discerned is coral. Ef­forts to expose the walls of the two formations we examined were in vain. On his second dive, David Ulloa found and filmed what was an extremely odd T-shaped area of a formation formed from straight, angular outer walls. In all of his extensive dives and filming experience, he related he had never seen natural coral formations like these. The only things that look similar, he explained, are building remains swept into the ocean, or wrecks, although wrecks wouldn’t be deposited in regularly spaced debris piles. These formations instead appear to be buildings or enclosures of some type. David’s film also revealed a rectangular depression in the sand near one of the coral formations that clearly had sharp right angles at its corners. If this is a structure, the sand may have formed enough of a barrier to prevent the thick coral overgrowth we observed on the other rectangles and might allow us to identify actual building stones. From a frame-by-frame analysis of the more than two hours of film we obtained of the formations with our drop camera, several things stand out. First, it is clear that there are some square and rectangular blocks associated with several of the formations. In some places on the outer walls, it appears that small blocks are stacked together or sim­ply collapsed. In addition, the formations that have “depressed” or low center areas do look like building remains and are perhaps what one would expect to see if a small stone structure became submerged and subsequently became cov­ered with coral. We also found formations that appear to have stepped tiers as well as one distinctive area that looks like a ramp from the top of one of the formations. There is no doubt that this intriguing set of formations sits just above the shoreline that was present off Bimini in 10,000 BC. And there is no doubt that from this initial investigation the formations do not look natural, though the ones we were able to view are almost completely covered with coral. Communications with coral reef experts reveal that similar coral formations with such regularity of placement are simply not known. The square and rectangular formations at Bimini, oriented in the same fashion, do not appear to be natural. They have well-defined walls and some of them definitely have what seem to be blocks forming areas of their outer walls. They have the distinct ap­pearance of buildings. But, obviously, before the claim can be made that these are buildings or support structures, more work needs to be done and that is already planned. Curiously, there are several areas in the Mediterranean where similar building orientations have been found asso­ciated with harbors. In Glenn Markoe’s 2000 book, Phoenicians, several locations are depicted as being similar to what is at Bimini. One of these is the Punic settlement of Kerkouane in Tunisia where a series of square and rectan­gular walls (of the same size of those at Bimini) is shown. Another is the “pier and rubble” construction at Lebanon, Beirut. But what is at Bimini would be far older, dating to 10,000 BC. One of the questions we posed with the History Channel is “what would one expect to find if buildings were sub­merged for 12,000 years in an area where coral grows?” The truth is you’d expect to find precisely what we found. 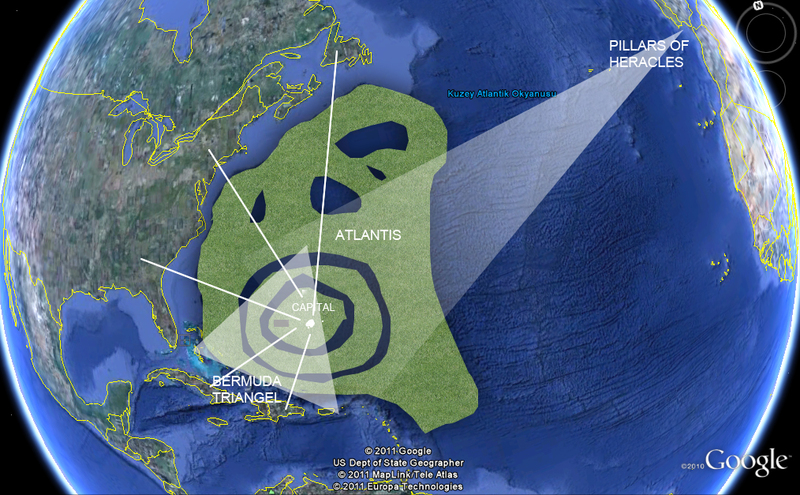 But all of this begs the question: Is this Atlantis? The answer isn’t definitive, because we know that skeptics will assert that it’s just natural coral; although from our research and inquiries of experts, we know that no other similar coral formations exist. What has to be done is a thorough exploration of several of these formations to clearly identify precisely what lies under the coral. That will answer the question, but one issue implied in such a question bears mention. In the known history of the world, there is only one account of a maritime culture that existed 12,000 years ago. That is the account of Atlantis given by Plato some 2400 years ago. Thus, if the underwater Bimini formations lying on the 10,000 BC shoreline are build­ings, which they appear to be, then by definition, Atlantis has been identified. they really found it!!! here is the map.